inv dec (invisible decrease): Insert hook into front loop of next st, then insert hook into front loop of following st, YO, pull through 2 loops. YO, pull through 2 loops. Rows 12-19: Repeat Rows 2 and 3, four times. (18) Don’t break off. Rows 4-23: Ch 1, turn. Repeat Rows 2 and 3 ten times. (37) Break off, leaving about a yard of yarn for sewing later. Weave in the other end. 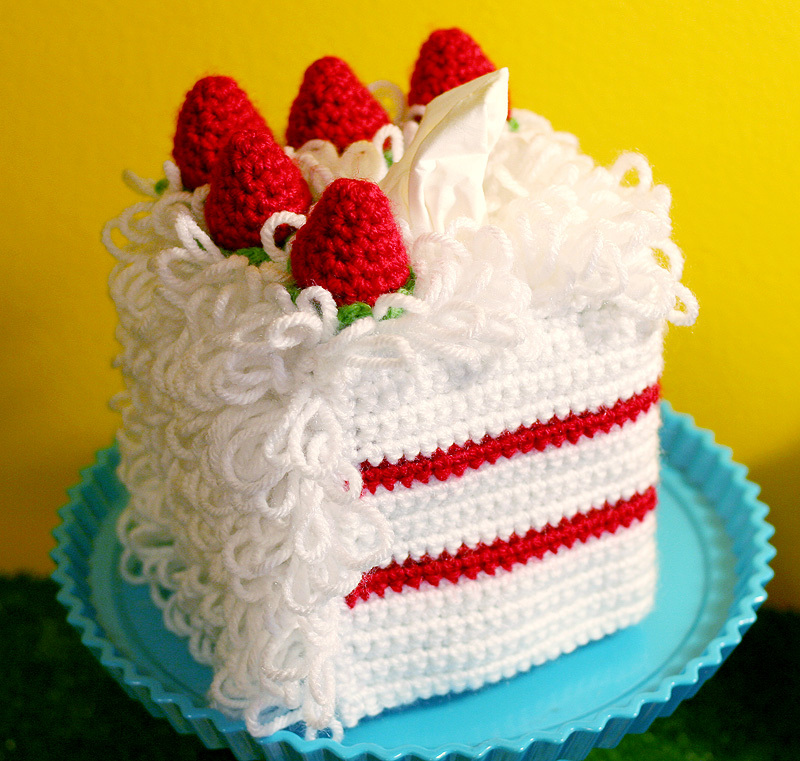 You’ll be creating the next 2 sides of the cozy with 3 layers of white cake and 2 strawberry stripes. Rows 2-6: Ch 1, turn. Work 38 sc evenly across. (38) After Row 6, drop White (no need to break off) and join Scarlet. Rows 7-8: Ch 1, turn. Work 38 sc evenly across. (38) After Row 8, break off Scarlet and pick up White. You’ll see a little bit of the White yarn traveling up the side of the rows, but you can hide this when you sew the whole cozy together. Rows 9-14: Ch 1, turn. Work 38 sc evenly across. (38) After Row 14, drop White (no need to break off) and join Scarlet. Rows 15-16: Ch 1, turn. Work 38 sc evenly across. (38) After Row 16, break off Scarlet and pick up White. Rows 17-23: Ch 1, turn Work 38 sc evenly across. (38) After Row 23, break off and weave in the ends. * Fit the Cake Layers against your tissue box to see if it fits properly. I had to work one more row of White to make mine fit properly. Sometimes, even if the math is perfect, the project still might need some tweaking. Don’t sweat it! Break off leaving approx. 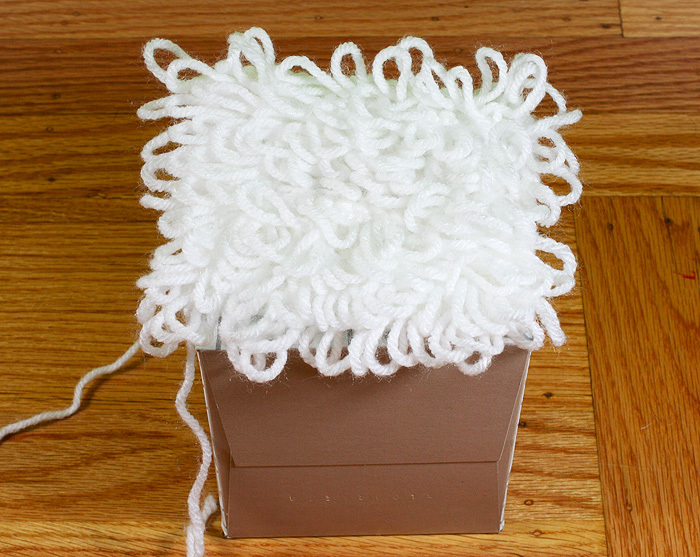 8 inches of yarn. With tapestry needle, use yarn tail to close hole by weaving through remaining 6 sts. Break off and weave in end. With Chartreuse, make adjustable ring, or ch 3 and sl st to 1st ch to form ring. Break off leaving 18 inches of yarn for sewing later. Weave in beginning tail. 1. 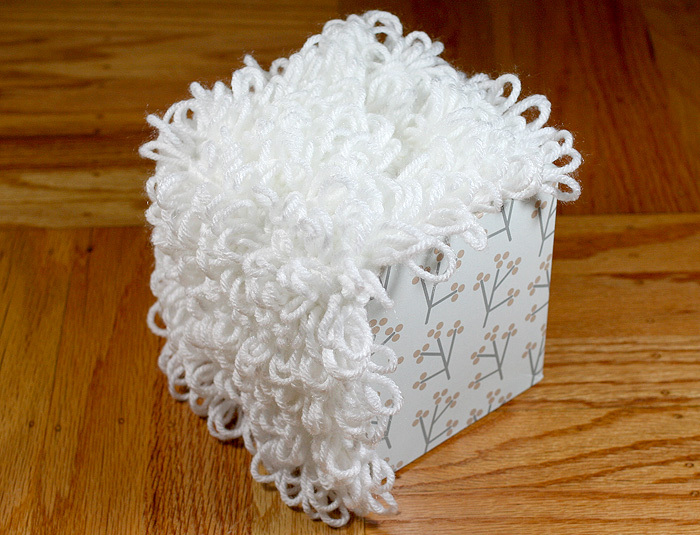 Put Loop Frosting on your tissue box and pin Cake Layers to Looop Frosting. Sew the pieces together with the long yarn tail you left on Loop Frosting. I find this is easiest to do while all the pieces are pinned to the tissue box. 2. 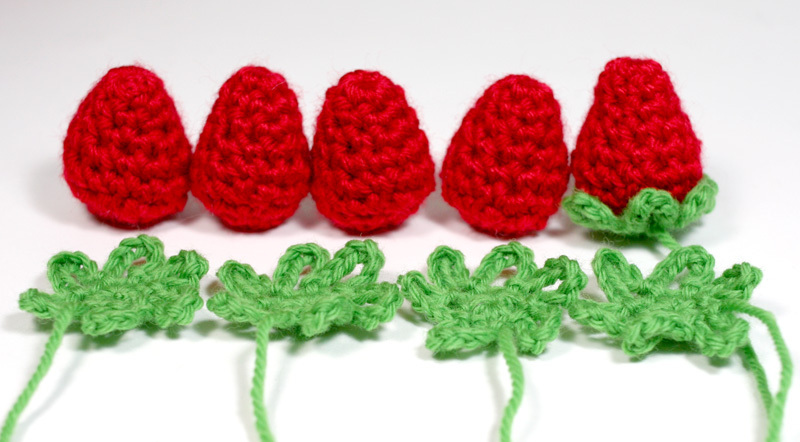 Plan where you want to sew on your Strawberries and then sew them down with the Chartreuse yarn tails.